Learn how to integrate the popular Spring Boot framework and Swagger UI library using the open source and flexible integration tool, Camel. Companies are using lots of systems which have to talk with each other. Therefore it's a good idea to use something to integrate these systems. Such an application integration can be done by an Enterprise Service Bus or even with an integration framework like Apache Camel. I highly recommend you use one of these and don't program it on your own by using lots of APIs. Please don't do this! I'm a big fan of lightweight integration and flexibility so it's not surprising that Apache Camel is my tool of choice. Apache Camel can be used in standalone mode by using a jar containing the Camel routes or as part of a runtime like Spring Boot or WildFly/WildFly Swarm, for example. I decided to use Spring Boot as runtime because it is widely used and comes with a lot of useful things, very good documentation, and so on. In addition to that, I'm using Swagger UI to get a beautiful API documentation which makes consuming REST APIs much easier. This blog post describes how to combine these technologies with each other. In case you just want to use the code, here's the link to my GitHub repository. You just change the Group and Artifact to the names you like and add Apache Camel as a Spring Boot Starters dependency. After that, you have to click on Generate Project and your project is up and running. 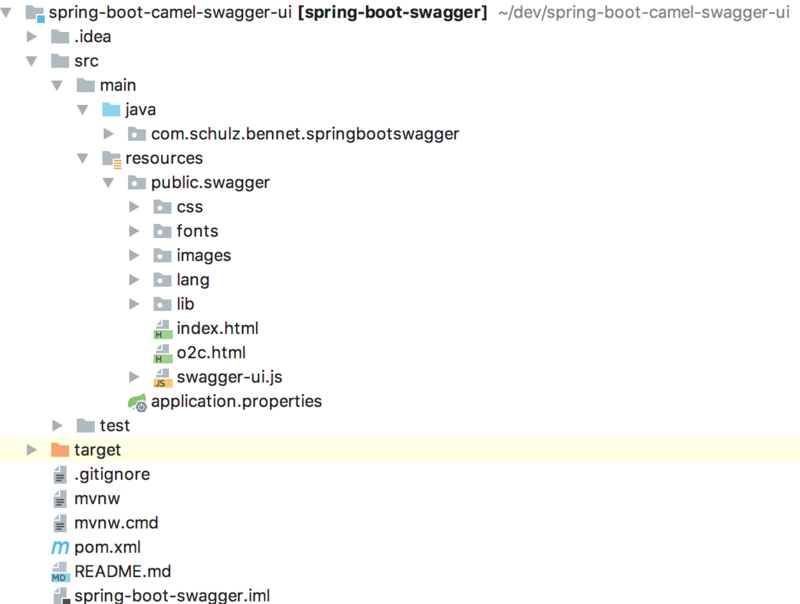 Now we can add the Swagger UI files to our Spring Boot project. This can be done by downloading the Swagger UI sources from GitHub. Note: I'm using Swagger UI 2.2.8 instead of the latest version because the Camel component doesn't support the new API specification of Swagger 3.X for now. After that, we have to create a new folder at src/main/resources which have to be named: static, public or resources to serve our static Swagger UI content via Spring Boot. Now we simply have to add the dist folder of Swagger UI to this folder to make Swagger UI available in our project. In the next step, we have to add a simple Camel route to the Spring Boot project. To do this, we have to add a Camel servlet first. After that, Swagger UI will use the Camel REST API instead of the sample petstore. It's important to change the base.path of the servlet to api because our REST APIs have /api/ as a prefix. 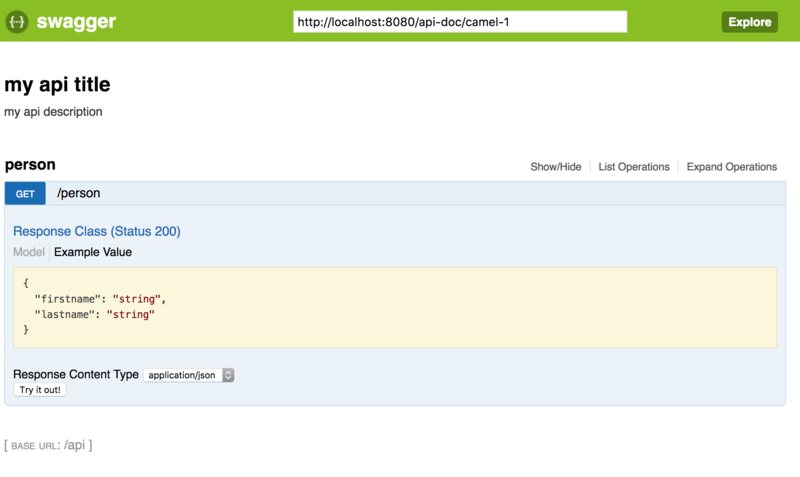 These steps let Swagger UI show a beautiful documentation of our Camel REST APIs.